(shared by both the STOL and Cruzer models): Provision for floats or skis CNC match-drilled skins and parts Factory riveted wing spars and lower cabin frame Made in the USA and supported by an industry leader Detailed BLUEPRINTS & CONSTRUCTION MANUALS (not just assembly instructions) insttructions) Extensive builder support network including Zenith.Aero online community Modular Construction Minimizes workshop space requirements LIFETIME TECHNICAL SUPPORT T FROM THE FACTORY Welded wing tanks (supplied ready to install in the kit) Kit includes wheels, tires, hydraulic brakes Acrylic (plexiglass) windshied and door windows Kit includes seatbelts with shoulder harness. The landing gear is optimized for orr “on “oon “on-airport” operations with small maller le wheels and available smaller fairings. Ease and simplicity of a steerable tricycle gear. Dual Swing-Up Doors Easy Cabin Access! This article is reprinted from the September 2014 issue of Sport Aviation magazine, the monthly publication of EAA. It covers the One Week Wonder project of Oshkosh 2014, during which a Zenith CH750 Cruzer was built by volunteers in less than a week. $W($$2VKNRVK $LU9HQWXUHWKUHH VHWVRI=HQLWKZLQJV WZRVHWVIRUWKH&+ &UX]HUPRGHODQG one set of wings for WKH=HQLWK&+ DUH EHLQJFRQVWUXFWHGIRU ($$FKDSWHUVWRWDNH KRPHDQGWREHFRPH part of a completed JURXSEXLOWDLUSODQH =HQLWK$LUFUDIW&RPSDQ\LV a proud Presenting Sponsor RIWKH($$*LYH)OLJKW program ! Above performance and specification figures with the Rotax 912 ULS engine (100 BHP). Standard atmosphere, sea level, no wind. Performance and specification figures based on prototype flight test results; subject to change without notice. Different engines and options will affect performance and specification figures. * Subject to meeting actual FAA rules. 24 Ft. 6 In. 10 Ft. 0 In. 106 MPH 35 MPH 1,200 fpm 16,000+ Ft.
105 MPH 39 MPH 720 fpm 14,000 Ft.
31 Ft. 4 In. 167 Sq. Ft. 1,300 Lbs. 2,200 Lbs. 9.5 m. 15.5 m.sq. 522 kg. 975 kg. 320 miles / 3 Hrs. 640 miles / 6 Hrs. 315 miles / 3 Hrs. 630 miles / 6 Hrs. Above performance figures with the Lycoming O-360 engine (180 BHP: 420 lbs. with accessories and fixed-pitch Sensenich 76-EM8-0-54 metal propeller). Standard atmosphere, sea level, no wind. Performance and specification figures based on prototype flight test results; subject to change without notice. Suitable power range: 150 - 240 BHP, up to 440 lbs. installed. Different engines and options will affect performance and specification figures. CH 750 Drawings & Manuals (must be purchased separately if building from component kits). Actual contents and equipment of the kit subject to change or revision. * Order with the Wings Kit. Shipping charges are not included. The price of the Drawings and Manuals includes shipping and handling. Rudder Starter Kit: Includes prepaid Rudder Starter Kit UPS shipping. No crating charge for loading and picking up the kit at the factory. No additional crating charge for tools shipped with kit orders. Zenith Aircraft Company has been established to service the needs of sport pilots as a Supply House for recreational aircraft hobbyists, making available aircraft designs, kits, and parts for educational purposes. Sometimes, things run into snags for reasons beyond our control. Most of them are so-called “Acts of God” like earthquakes, tornadoes, floods, fires, and the like, but some are also man-made, such as labor strikes, transportation snafus, etc. If they happen, customers get mad - and we don’t blame them - but we must assign the cause where it belongs instead of being blamed for all the trouble. We earnestly hope that you won’t run into any problems (most of our customers don’t), but we are obligated to let you know the extent of our protecting your interest that is within our power to provide. Please read the following carefully, because if conditions listed below are not acceptable to you, you should not place this order (unless changes are made with acceptance in writing from Zenith Aircraft Co.). Your filling in this Order Form and delivering it to us constitutes your understanding and agreement of the following conditions and requirements. Thank you for your goodwill and confidence in Zenith Aircraft Company. 1. No orders are accepted by Zenith Aircraft Co., hereafter also called the Company, or Seller, unless accompanied by a payment of not less than 50-percent of the list price of all parts / kit ordered, and unless accompanied with this signed Conditions of Sale and Warning Notice. Full payment is required for the Drawings and Manuals. 2. This contract permits the buyer to build one airplane or part of it in the Custom-Built, Experimental, Ultralight, etc. category. The type of aircraft and the Drawings serial number must be visibly marked on the vertical tail or fuselage sides of the aircraft. The buyer is advised that the Drawings, Manuals, and/or parts contain proprietary rights. The buyer covenants and agrees that he will not: a) Reproduce, b) Communicate, c) Transfer, sell, exchange or modify them or any part of them, d) Permit any other person to use said drawings, manual, and/or parts, without the written permission of the Company. The sole purpose of the plans, drawings, manuals, and parts is strictly educational and there is no implied or expressed warranty. During the construction the buyer is to cause the structure and installations to be inspected and approved by the relevant government and/or aviation authority (FAA). The Buyer agrees to notify the Company in writing immediately of the sale of any Drawings and Manuals, parts, components, or kit, whether completed or not, supplying the complete name and address of the new owner(s). 3. The Company will not be held responsible for any delays in deliveries due to delays of carriers, fires, and other Acts of God, or other causes for delay beyond its control. 4. Claims for defective materials or missing parts will be allowed only when such claims are made within thirty (30) days from the date of delivery. No goods may be returned unless previously authorized by the Company. (Inspect your order for missing or damaged parts immediately upon receipt). 5. Orders accepted by the Company may be canceled by the buyer within fifteen days of the date of order without the company’s advance approval, provided: a 10-percent cancellation charge is assessed if goods were not yet shipped, or a 20-percent charge if the goods were shipped and are returned. Any delivered order not picked-up or accepted by the buyer for more than thirty days shall be considered to be forfeited. Drawings and Manuals, or other printed materials, may not be returned for credit or refund. PROVIDED HOWEVER, in no event will seller accept goods for return for any reason the earlier of thirty days (30) days from the date of shipment, or assembly, installation, construction, or modification of any product, whichever occurs first. 6. Unless otherwise specified, the buyer agrees to pay in full for, and take delivery of, the merchandise in not more than two weeks after receiving notification that it is ready for shipment. Storage rental shall be charged beyond that time. It is the sole responsibility of the buyer to pay any applicable sales tax or usage tax, in whichever state(s), and all applicable shipping and shipping related charges. 7. All orders not delivered for lack of shipping instructions, payments, or any other delays caused by the buyer for longer than thirty days shall be considered forfeited and void, and the Company will have the right to scrap or dispose of the merchandise at its discretion and retain the full deposit. 8. All prices are F.O.B. Factory and subject to change without notice. Delivery to the Carrier shall constitute the delivery to the buyer, and the responsibility for the goods in transit shall be the Carrier’s and the buyer’s. A Bill of Lading (or Way-Bill) shall be sufficient evidence and proof of the date of shipment. Claims of damage in transit shall be made to the Carrier and not the Company. NOTICE: If any container or crate shows the slightest damage on delivery, it should be opened and inspected before acceptance from the Carrier, and a statement of damage made immediately. Insurance of goods in transit is the responsibility of the buyer, and the Company will not pay for goods damaged in transit, nor for shipping charges to and from the factory of returned shipments, damaged, or replacement parts. 9. This contract shall be governed by and construed in accordance with the laws of the State of Missouri, and is the only contract controlling this sale and purchase, and it contains all the agreements, expressed or implied, either verbal or in writing, made between the Company and the buyer. If any provisions of this contract shall be held to be invalid, the remaining provisions shall continue to be valid. This Agreement and the covenants, promises and agreements contained herein shall be governed in accordance with the laws of the state of Missouri, United States. This Agreement shall be deemed executed and delivered in Missouri. The parties consent to the venue of any state court sitting in Audrain County, Missouri, United States, or the United States District Court, Eastern District of Missouri, in any action brought to enforce the terms of this Agreement. The parties irrevocably and unconditionally submit to the jurisdiction (both subject matter and personal) of any such court and irrevocably and unconditionally waive: (i) any objection any party might now or hereafter have to the venue in any such court; and (ii) any claim that any action or proceeding brought in any such court has been brought in an inconvenient forum. The parties acknowledge that the United Nations Convention on Contracts for the International Sale of Goods shall not apply to this Agreement. 10. Custom-built aircraft are licensed by the government to fly in the applicable “Experimental,” “Amateur-Built” or “Ultralight,” etc. category. Each aircraft is treated legally by the governing authority (FAA) as a “one-of-a-kind” in design and construction, and is liable to be unpredictable, hazardous, and even potentially lethal. Therefore, construction and operation of such aircraft may be unsafe without acquiring, studying and complying to the letter of all instructions and manuals pertaining thereto. The Seller does not warrant that the aircraft as constructed by the buyer, or any other person, will be airworthy, or will qualify for certification or registration by aviation authorities, or will meet the requirement of the buyer. Notwithstanding the forgoing, seller may provide from time to time, but is not required to provide, technical assistance during the assembly, installation and construction process. However, buyer and seller specifically agree that responsibility for building the aircraft or its parts shall rest solely with the buyer and that no liability shall arise from or extend from any technical assistance provided by seller. Purchaser acknowledges that the assembly and construction of the product requires certain technical experience and skill. Further seller and purchaser specifically agree that the seller cannot and does not warrant the ability of any individual, including purchaser, to properly assemble, construct and maintain an aircraft kit of the kind sold by seller. In exchange for such technical assistance, purchaser and seller specifically agree that purchaser shall hold harmless seller from any and all liability which may arise from any technical advice provided by seller, seller’s employee, or seller’s agent. 11. EXCLUSIONS OF WARRANTIES, NO WARRANTIES. THE IMPLIED WARRANTIES OF MERCHANTABILITY AND FITNESS FOR A PARTICULAR PURPOSE AND ALL OTHER WARRANTIES, EXPRESS OR IMPLIED, ARE EXCLUDED FROM THIS TRANSACTION AND SHALL NOT APPLY TO THE GOODS SOLD, THE CONSTRUCTION OF THE GOODS, THE PLANS & MANUALS, THE GOODS WORKMANSHIP, THE SAFETY OF THE GOODS DESIGN OR ANY OF THE GOODS COMPONENTS. 12. In recognition of the above, and because they cannot control nor assure quality and accuracy of compliance with their instructions during and after construction of such aircraft, the Seller and/or Owner (and their agents, servants, employees, contractors, successors and assigns) hereby give notice to the Buyers and/or Operators (and their heirs, administrators and assigns) of this aircraft, that they carry no liability insurance. 13. BY SIGNING THIS DOCUMENT, AND BY PROCEEDING WITH THIS ORDER, THE BUYER ATTESTS THAT HE HAS THE FULL AUTHORITY AND CAPACITY TO SIGN AND VALIDATE THIS DOCUMENT. THE BUYER(S) AND/OR OPERATOR(S), AS DEFINED ABOVE, ACKNOWLEDGE THE RECEIPT AND UNDERSTANDING OF THIS WARNING NOTICE AND SO SIGNIFY, BY THEIR DECISION TO GO AHEAD WITH PURCHASING, ACCEPTING AND OPERATING THIS AIRCRAFT, OR ANY OF ITS PARTS, AND AGREE TO HOLD THE SELLER AND/OR OWNER, AS DEFINED ABOVE, HARMLESS FROM ALL LIABILITY AND FROM ANY CLAIMS OF DAMAGES AND CAUSES OF ACTION WHICH MAY BE INCURRED BY THEM OR ANY THIRD PARTY AS A RESULT OF THE PURCHASE, USE, CONSTRUCTION, AND OPERATION OF THIS AIRCRAFT, ITS PLANS, PARTS AND COMPONENTS. BUYER AND/OR OPERATOR HEREBY ASSUME ALL RISK, LIABILITY AND RESPONSIBILITY RELATIVE TO THE CONSTRUCTION AND OPERATION OF THE AIRCRAFT. SPOUSE / NEXT OF KIN SIGNATURE: If more than one buyer, each buyer must sign this form. 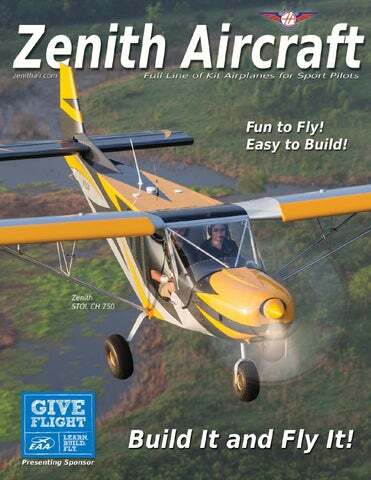 7/2014 z ZENITH AIRCRAFT CO.
ZENITH WORKSHOPS FOR FIRST-TIME KIT AIRCRAFT BUILDERS  LEARN TO BUILD A ZENITH KIT AIRCRAFT  A hands-on introductory workshop on building an all-metal aircraft. If you've always dreamed of building your own airplane, or simply want to learn more about all-metal aircraft construction, Zenith Aircraft Company is providing you with the opportunity to learn all about building a Zenith aircraft at one of its factory workshops, where you can actually start building your own airplane. The workshops are coordinated by Zenith Aircraft staff and held right in the factory. Small group sizes make the workshops very productive and educational.